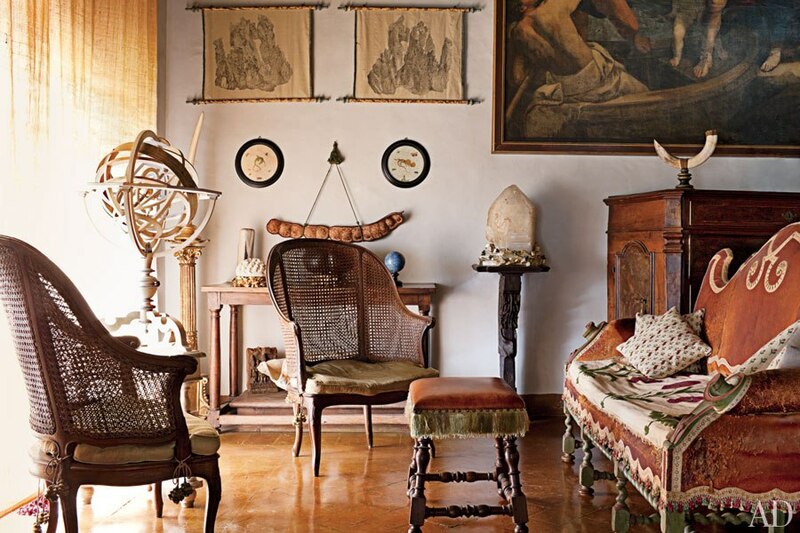 Antique Italian interiors often evoke nostalgia for the gentler days of the past. 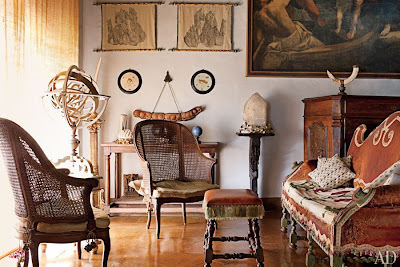 one of the world’s greatest authorities on Roman and Byzantine marble, a scholar of Tantric Buddhism, and for more than 40 years a professor of Indology at Sapienza Università di Roma, Gnoli knows what he likes and what he doesn’t. a private museum of natural history the count calls his Wunderkammer. In this high-ceilinged chamber a gigantic egg laid by a prehistoric bird dangles from a gleaming wood beam, and African turtle shells, narwhal tusks, and fossils compete for attention with cabinets and pedestals crowded with seashells and rock crystal. Before the windows stand armillary spheres of Gnoli’s own design, while his latest creation, a mighty globe that awaits its painted oceans and continents, is positioned near the center of the room. We're particularly attracted to the 'mighty' floor globe, armillary sphere, and the small desk globe on a sidetable below the hanging of a tropical legume's giant seed pod. 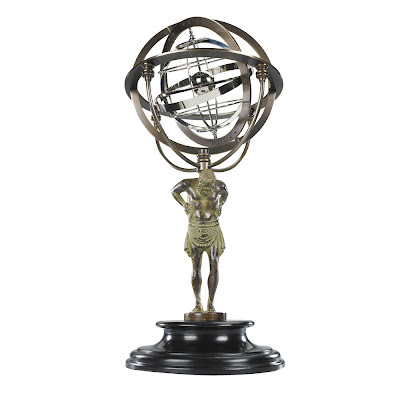 You, too, can make your very own Wunderkammer that features a magnificent floor globe, armillary sphere, and desktop globes as masterful centerpieces. Of course, they will not be exact replicas of Count Gnoli's self-designed globes—you might not even be aiming for Italian pizzazz, and we have reason to believe even the desktop globe is a design of his—but, with Ultimate Globes' collection of Old World globes, you'll have the opportunity to own globe masterpieces that, even if not as one-of-a-kind, but are certainly as masterful—and equally magnificent. 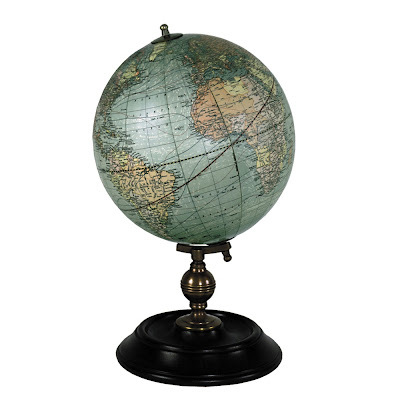 Weber Costello 1921 USA Globe – This one comes closest in form to the desk globe in the picture (here's another style). 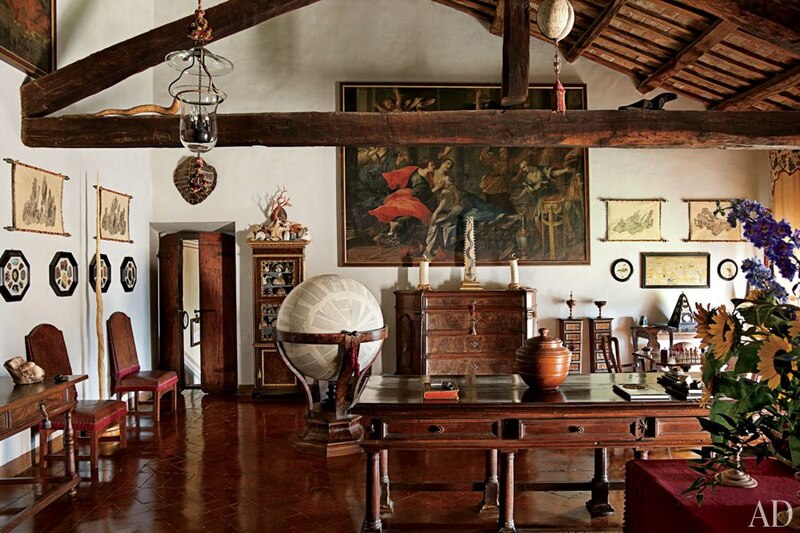 Like the one in Count Gnoli's wonder-room, it has no visible meridian. 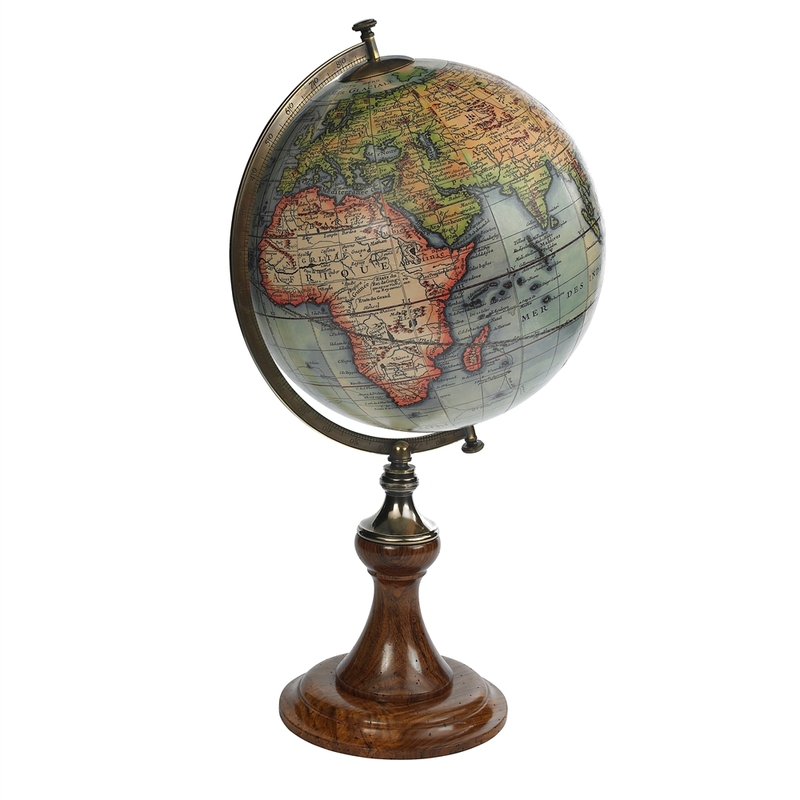 Although the 1921 USA Globe is not 17th-century styled, it does evoke the glory days of the Dawn of Air Travel and Air Freight. It's greenish gray hues would complement a room that has purple and magenta accents. Imagine this globe on a walnut desk and paired with an arrangement of these orchids—a glamorous meeting of East and West, evoking the words "fly the ocean in a silver plane." 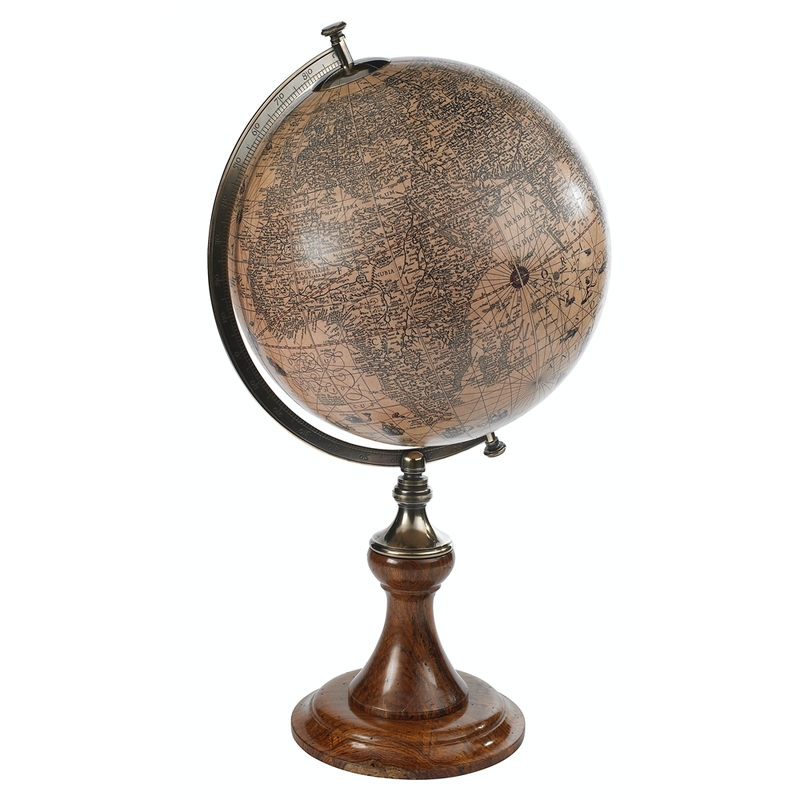 For a truly 17th-century flavor, here is the Hondius 1627 Globe with Classic Stand, evoking the heyday of the Dutch mercantile empire. Nothing is mightier in Ultimate Globes' Very Large Floor Globes collection than Replogle's Diplomat. 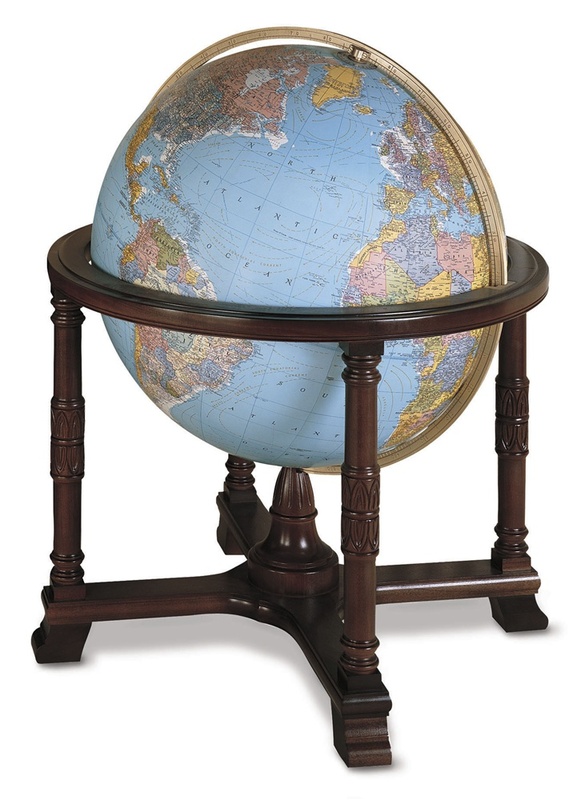 A 51-inch tall, 32-inch wide illuminated sphere on a solid walnut-finished mahogany base and cradle-mounted on a brass full meridian, the Diplomat has over 20,000 place names and is known as "the most detailed globe in the world" and future-proofed through its own Replogle Updatable Globe Program. This not only fits in a place suffused with an intellectual atmosphere (libraries private or public), but is also a great conversation piece. You might want antique-style, 20-inch wide options like the Annapolis . . . If you're aiming for that nostalgic, old world feel in a room, consider adding an Ultimate Globes Old World Globe.